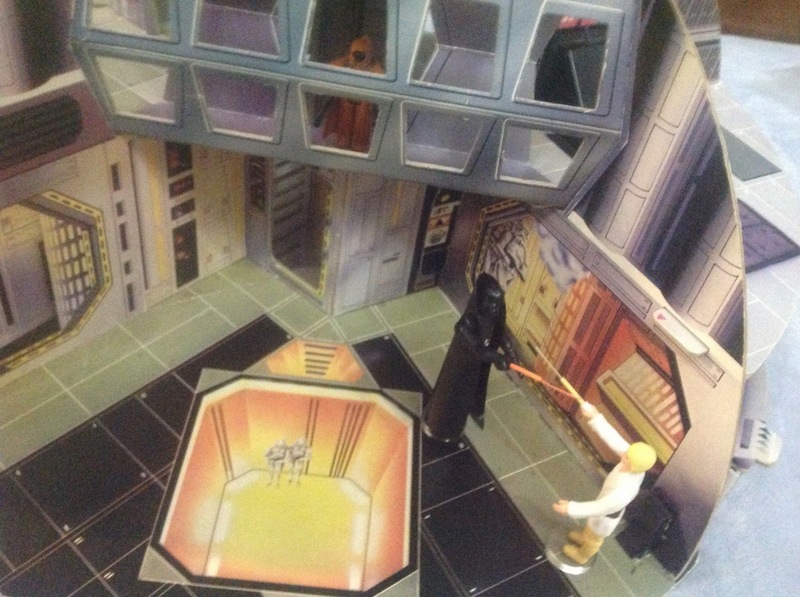 Recently, my friend Yehuda Kleinman told me about the differences he'd noticed among the various versions of what is usually known as the "Palitoy Death Star." I asked him to write this summary putting them into context. So without further ado, here's guest blogger Yehuda on one of my favorite Star Wars toys. As Kenner Star Wars toys took the United States by storm, it wasn't long before the rest of the world was to follow. 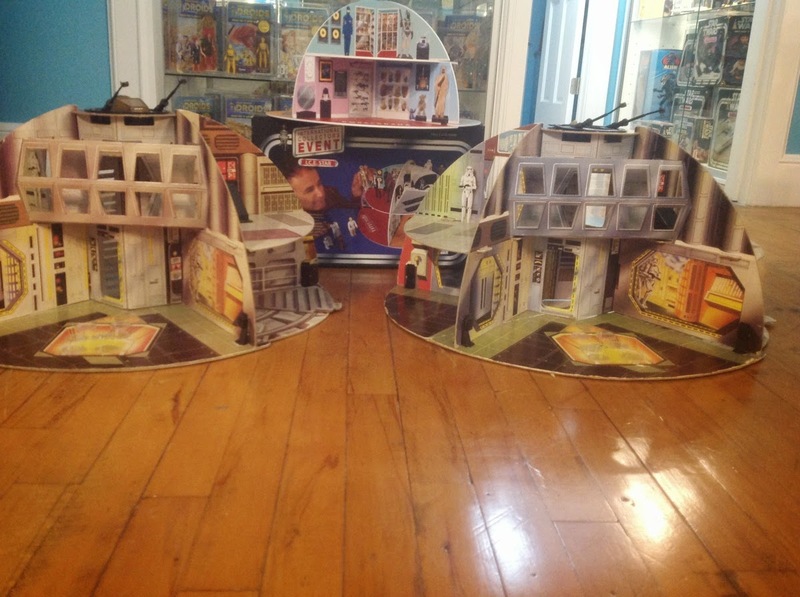 Kenner toys -- having successfully risen to the challenge of delivering action figures, playsets and vehicle toys for the first Star Wars movie to children in the United States -- was poised to now market these toys to children throughout the rest of the world. Kenner toys, being a United States-based toy manufacturer, partnered with well-established foreign toy manufactures in different parts of the world to take over production of the Star Wars toys for the various foreign markets. Foreign toy manufacturing companies ran into several additional financial obstacles during the production of Star Wars toys. First and foremost, a large licensing fee had to be paid to Kenner for the privilege of producing the toys. Another financial hurdle, particularly for the European markets, was the higher cost of plastics and plastic manufacturing. In order to make producing toys in the foreign markets feasible and profitable, cost cutting measures had to be taken. This article will be one in a series focusing on the unique differences of the toys and playsets produced worldwide due to this phenomenon. Collectors have grown to appreciate these rare foreign sets for their unique, kitschy, cheaper appearance and alternate features, many of them made with differing materials. Although these changes, at times, decreased the play value of a toy, surprisingly, the changes were often an improvement over the original, more expensive designs. In the case of the Death Star, the necessary changes yielded a beloved, completely unique toy not available in the United States. 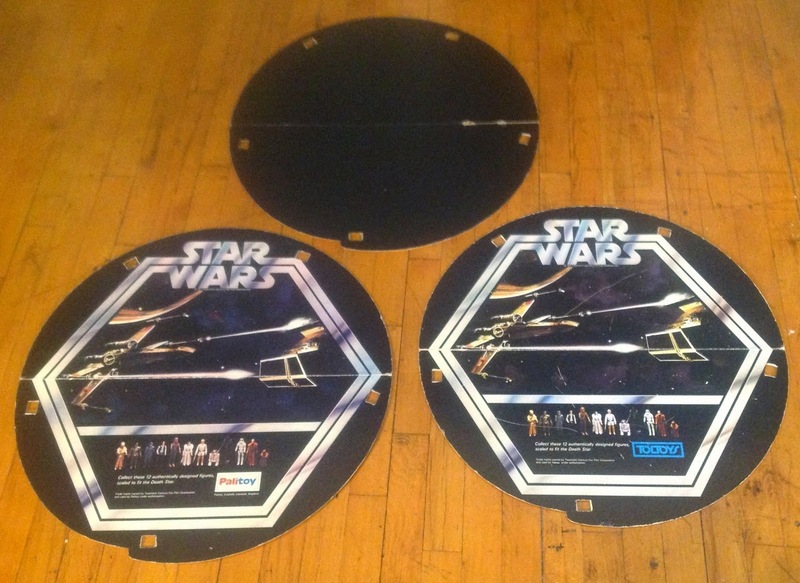 This post will focus on the European Death Star playset. Originally designed and manufactured by the Palitoy company as an answer to Kenner's "Death Star Space Station." The article will also delineate differences in the sets as they were manufactured globally by other companies. One of the most well known alliances that Kenner toys ever had was with the Palitoy toy company located in the United Kingdom. Palitoy was able to produce the first 20 carded figures in a fashion nearly identical to those released in the United States. Though their packaging required minor design changes, there was no sacrifice in quality. However, the financial burdens required by design changes significantly increased with the size of the toy. In general, the larger the plastic toy to be made, the more radical the changes that will be found in the foreign editions. The Kenner Death Star Space Station was by far the biggest playset that Kenner manufactured for the first Star Wars film. 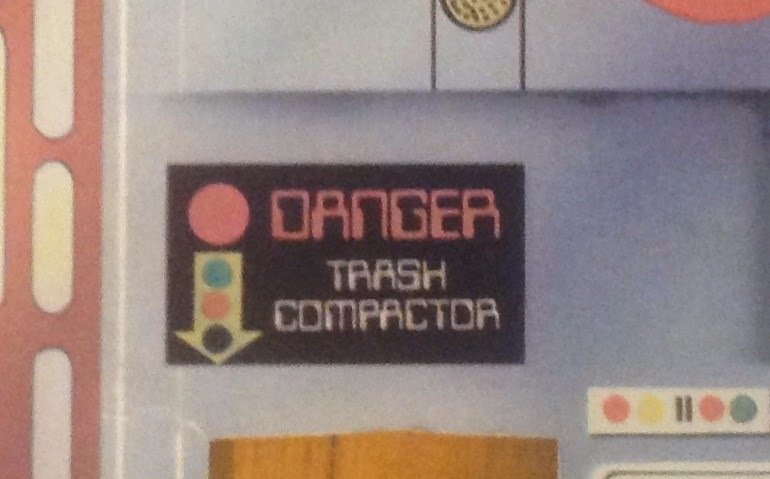 It featured four large plastic floors, and included a plastic elevator, drawbridge, gunner floor with exploding gun, and a working trash compactor with trap door. In order to manufacture a Death Star to Kenner standards, Palitoy had to produce a version with all these features and at the same time keep costs low by using very little plastic. Their solution was cardboard. Where other toys were concerned, Palitoy did its best to stay true to the original Kenner designs. With the cardboard Death Star, however, they created an entirely original design -- one that completely reinterpreted the features of the Kenner toy. 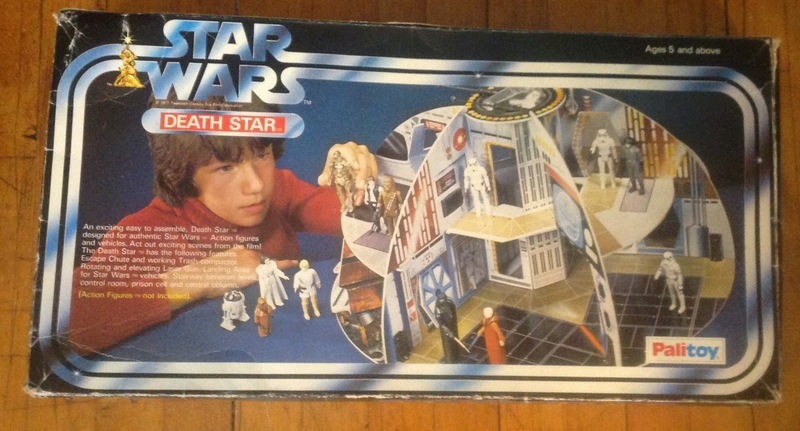 Termed simply the "Death Star" on the box or the " Death Star Play Centre" on the instruction sheet, the playset was a sturdy cardboard hemisphere with colorful graphics measuring approximately 24 inches in diameter and 12 inches in height. Its only plastic parts were a plastic garbage chute; 12 plastic clips to attach the walls of the playset to the base (of which only 10 are needed and two are spare); 6 clear plastic figure stands; a small, very flimsy black gunner chair with a clear canopy; and two guns (identical to those found on the X-Wing). Palitoy's solution to the Death Star was later adopted by four other countries for manufacture due to its successful cost-cutting measures. Each of the five countries featured minor variations in either packaging or in the playset itself. The toy was manufactured in Great Britain by Palitoy, Australia by Toltoys Australia, New Zealand by Toltoys New Zealand, France by Meccano, and Canada by Kenner Canada. Each Country produced a unique box and unique set of instructions, yielding five boxed variations. The Kenner Canada playset also has a special offer version sold through the Sears Christmas Wishbook, which included a special offer sticker advertising two free Stormtroopers included with the playset, bringing the total number of boxed variations to six. 1. UK: Death Star - Standard palitoy box. 2. France: Etoile Noir - Same graphics, but with text translated into French, and a Meccano logo. 3. Kenner Canada: Death Star - Same graphics, but with Kenner logo. 4. Kenner Canada: Death Star - Special offer with sticker advertising two included stormtroopers, and a Kenner logo. 5. Australia: Death Star - Toltoys logo. 6. New Zealand: Death Star - Toltoys logo, and a unique board-game-style box with a bottom and a lid. The loose sets, however, comprise only three variations, as the those released in the United Kingdom and France are identical and share Palitoy markings. Additionally, the Toltoys Australia playset is identical to the loose Toltoys set native to New Zealand. 1. Britain and France: The standard Palitoy version, with Palitoy logo on base. 2. Australia and New Zealand: Nearly identical, but with two major differences. First, and most obvious, the base features the base features the Toltoys logo and associated information. Second, the Toltoys version is made from a material is that is quite different from its European counterpart. Specifically, it's slightly denser. 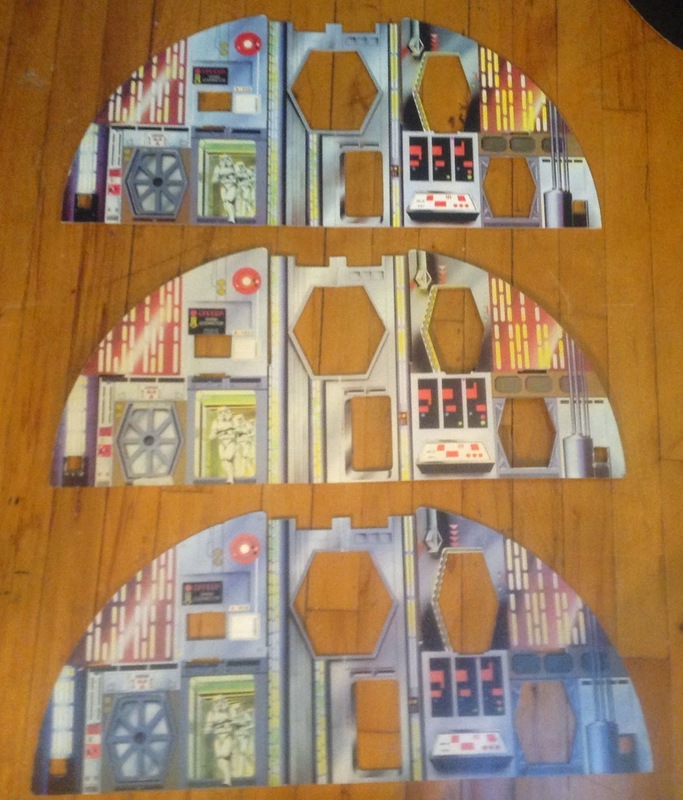 In addition, parts from this set can be differentiated from the Palitoy version by looking at the most superficial layer of the cardboard just beneath the graphics layer on either side of each part. 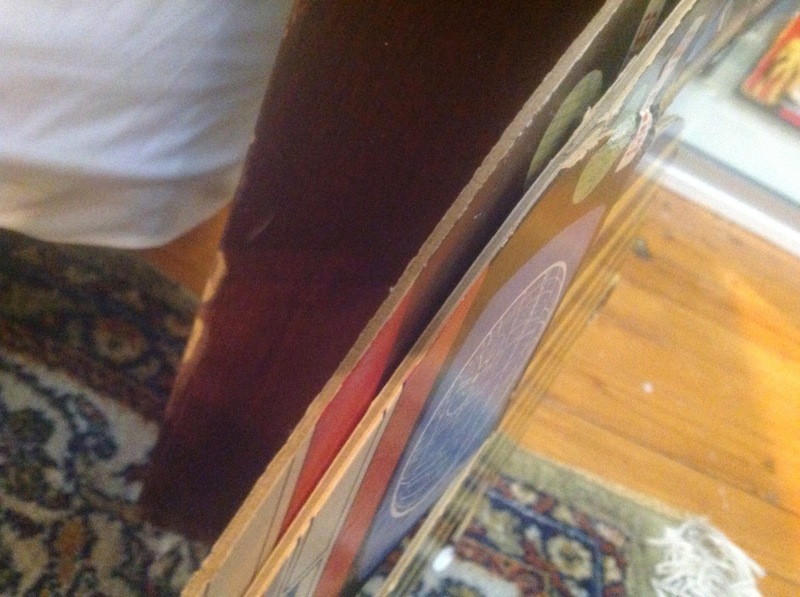 The cardboard on these sets is brown in the innermost portion but tan on the more superficial layers below the graphics, giving the cardboard a striped appearance. 3. Canada: Produced by Kenner Canada subsidiary Irwin Toys, a board game manufacturer, this version lacks graphics on the bottom of the base. Instead, it features a leatherette backing similar to what would be found on the back of a board game. Additionally, Canada being a bi-lingual country, with laws mandating that commercial goods feature both English and French markings, there are some language differences on the Canadian version of the toy. 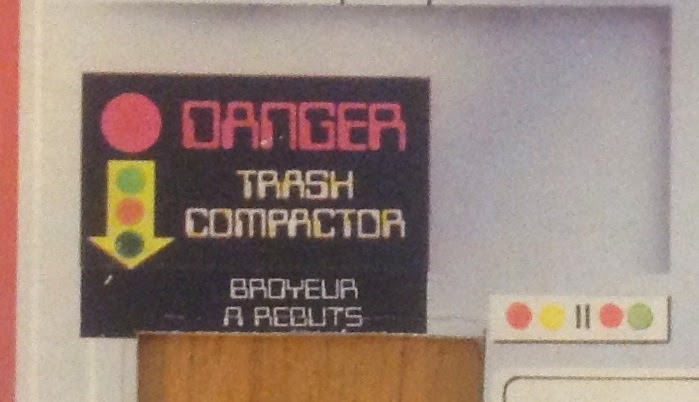 Specifically, the sign above the the trash compactor is printed in both English and French. This is especially interesting considering that, in France, Meccano released the standard Palitoy set printed only in English. 1. The parts of all these sets are compatible, and many sets have been pieced together over the years, leading to a lot of hybrids. 2. All sets were accompanied by an instruction sheet from the country of origin. 3. All sets came with two plastic bags, a large one for the cardboard parts and a smaller one for the plastic ones, and no cardboard box inserts. 4. The set came with two mirrored stickers, to be applied to the base. 5. 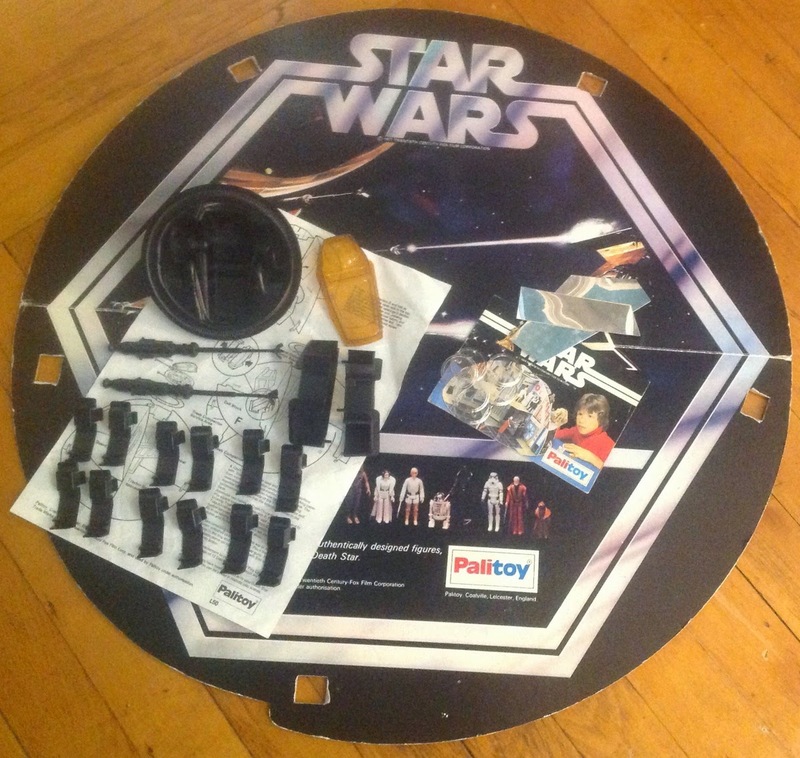 Some of the Palitoy playsets came with the rare mini-catalog featuring the cardboard Death Star on its cover. 6. The plastic guns are the same as the standard guns found on the X-Wing vehicle. 7. 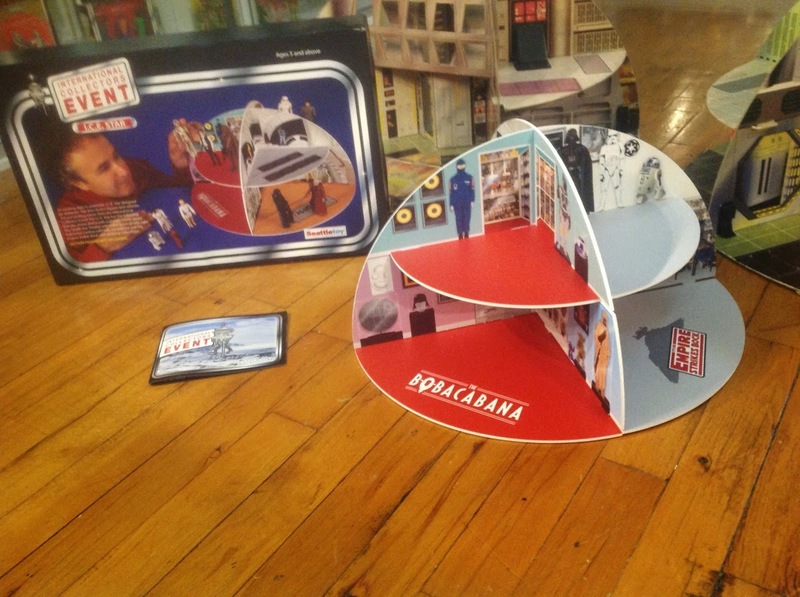 Canada was the only country to have both the plastic version and the cardboard version of the Death Star available at retail. 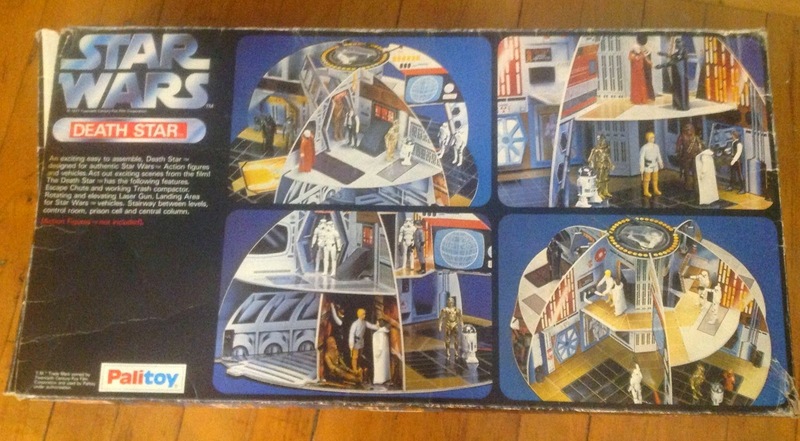 Even Kenner Canada's plastic Death Star had unique packaging. Not only was the box bilingual, it had a unique closure, opening with a hinge situated on the long axis. 8. There are other noticeable differences between the sets, including color variations in printing and slight size changes in cutout size. 9. 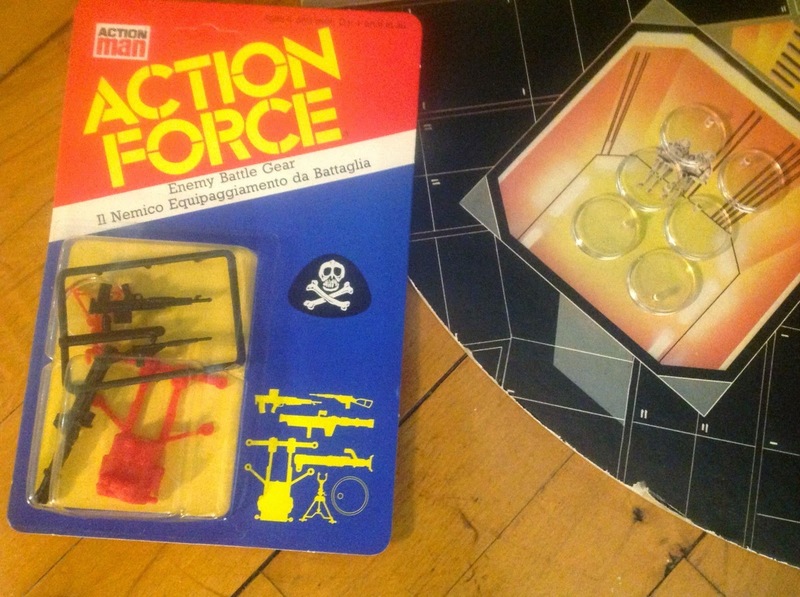 Of note, the clear plastic stands that were included with the playset were manufactured by Palitoy for their Action Force line. 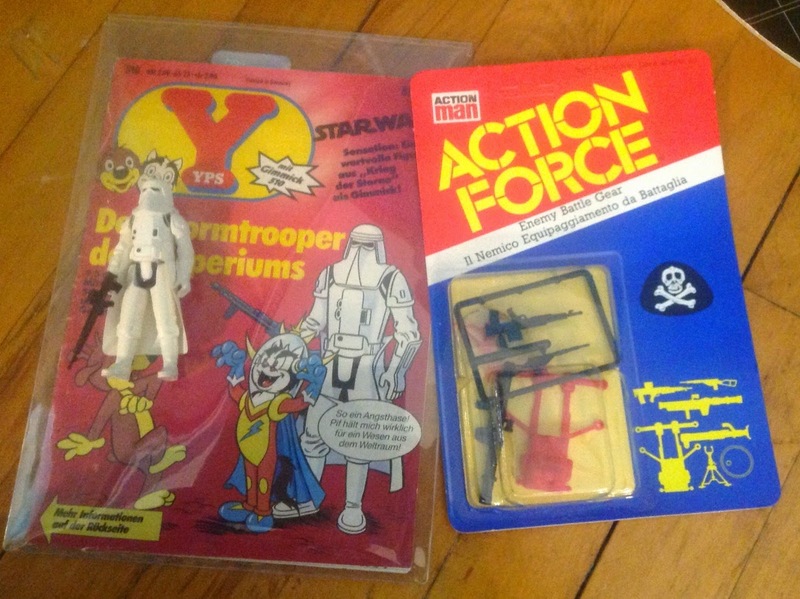 Below is a picture of an Action Force weapon pack, which includes a Palitoy figure stand as well as another rare Star Wars part, the alternate rifle for the Hoth Stormtroper given away as a premium in Germany with a YPS comic. Below you will also see pictures of the seventh -- and rarest -- version of the playset. Titled The "Ice Star" it was only available in Seattle in the Summer of 2013. Great summary, now I really need to pick up a Death Star! I have an immaculate Palitoy Death Star, even the box is almost perfect, far better than the one in the picture and it's totally original, not one of those reprinted boxes that people are doing now. I've had it since I was young and always looked after it. I've been considering selling it for while but the money would have to attractive for me to part with it. Awesome article Yehuda, it covers everything that can be said about the famous cardboard Death Star !! Great write-up. THis really helped to clear-up some misconceptions I had. These have always been great sets I would have loved to play with as a kid in the US. This will certainly be an article I will refer to in the future.